Hakan Comments: I picked this up in Picocon 29 in London today. Cost me a grand total of 1. Interestingly this was mainly before the hippy ages so I am not sure what they were smoking. “Hugo” winning, eh? I bet the “cover art” won a few “awards” of its own! The art director spent most of the cover’s budget on magazines with half-naked men in ’em, trying to find ‘just the right one’. So this is what Terry Gilliam has been up to. What’s that little sigil on the red sticker that says the book originally cost 2/- ? Is it a Ku Klux Klan headpiece? @Adam: it’s a rebus. It’s a ‘teepee’, with ‘T P’ on it for ‘Trade Paperback’. Until I saw the letters “T.P.”, I thought it was a wigwam. I’m trying to figure out if paying two shillings for this in 1967 would have been a good investment, given that it has just changed hands for Â£1. Isn’t that like 22% APR or something? 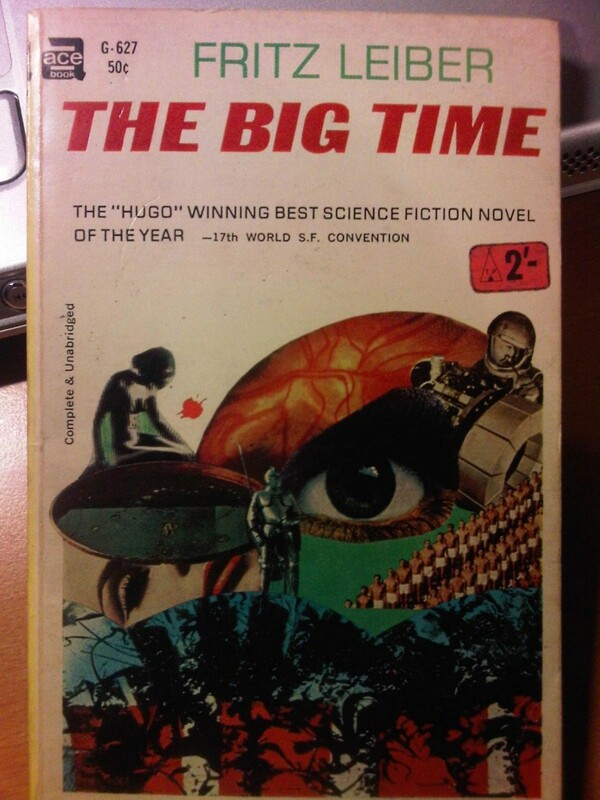 When I get my time machine working, I’m off to the late ’60s to invest in some Leiber paperbacks. Needs more glitter and macaroni. Did someone say big time? @fred: ah, that bulge in those big big big big big big big big big big BIG! must be the eyeball. Boo! I LOVE Hoot von Zitzewitz’s collages… perhaps not his best but definitely not a bad cover! This must be why I’ve had ‘Modern Girl’ by Sheena Easton running around my head all day. Is that the Danish Little Mermaid statue on the upper left? @A.R.Yngve: Yes and it looks like she’s riding a surfboard.